The observation that the nature and principles of genetic interactions appear to be conserved between yeast and man (Costanzo et al, Science, 2016; Blomen*, Májek*, Jae* et al., Science, 2015) implies that the majority of human genes should engage in genetic co-dependencies. Examples of genetic interactions. Adapted from van Leeuwen et al., Science 2016. This suggests that different types of human disease with a genetic component may be susceptible to secondary genetic insults in trans as a result of their wiring. In cancer it has been historically difficult to drug the absence of tumor suppressors given the lack of a target in most cases. The search for synthetic lethal relationships of tumor genes has lagged behind expectations (Nijman and Friend, Science, 2013) but with improved possibilities for loss-of-function genetics approaches this might change (see e.g. Steinhart et al., Nature Medicine, 2017). Similarly, we are only just beginning to appreciate the scope and qualities of genetic suppression (van Leeuwen*, Pons* et al., Science, 2016). We are interested in studying both genetic phenomena and exploit them to manipulate cellular states based on genome-wide loss-of-function surveys in defined CRISPR-generated mutants. We hope to identify cancer cell vulnerabilities and genetic suppressors of disease phenotypes elicited by dysfunctional alleles. 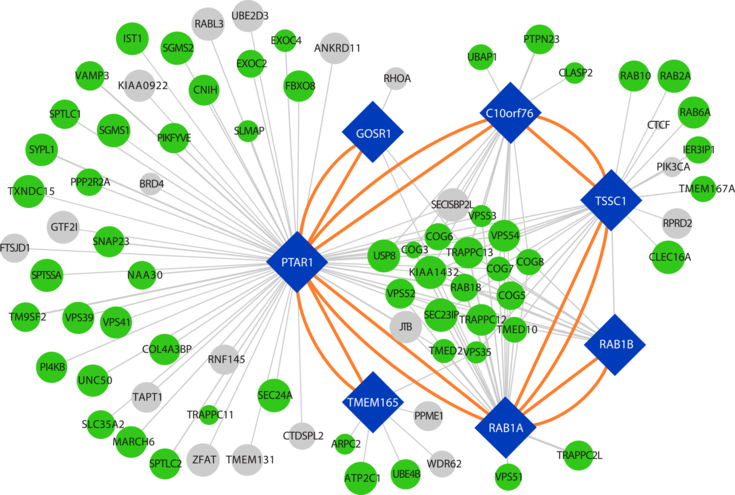 Synthetic lethality network of the human secretory pathway mapped through ultra-deep haploid mutagenesis in CRISPR-generated query mutants. Adapted from Blomen et al., Science, 2015.